Rhizobia bacteria engage in nitrogen-fixing root nodule symbiosis, a mutualistic interaction with legume plants in which a bidirectional nutrient exchange takes place. Occasionally, this interaction is suboptimal resulting in the formation of ineffective nodules in which little or no atmospheric nitrogen fixation occurs. Rhizobium leguminosarum Norway induces ineffective nodules in a wide range of Lotus hosts. To investigate the basis of this phenotype, we sequenced the complete genome of Rl Norway and compared it to the genome of the closely related strain R. leguminosarum bv. viciae 3841. The genome comprises 7,788,085 bp, distributed on a circular chromosome containing 63% of the genomic information and five large circular plasmids. The functionally classified bacterial gene set is distributed evenly among all replicons. All symbiotic genes (nod, fix, nif) are located on the pRLN3 plasmid. Whole genome comparisons revealed differences in the metabolic repertoire and in protein secretion systems, but not in classical symbiotic genes. Juan Liang and Anne Hoffrichter contributed equally to this work. The online version of this article ( https://doi.org/10.1186/s40793-018-0336-9) contains supplementary material, which is available to authorized users. Legume crops are central to sustainable agricultural practices and food security [1, 2]. They have a low need for synthetic nitrogen fertilizers input, as they engage in a symbiosis with a group of diazotrophic bacteria collectively known as rhizobia. This symbiotic interaction is initiated by a molecular crosstalk between rhizobia and their cognate legume host. Upon recognition of specific signals, legume plants intracellularly accommodate rhizobia inside root organs called nodules, where they engage in a bidirectional nutrient exchange . Occasionally, suboptimal interactions establish between the symbiotic partners. These lead to the formation of ineffective nodules in which limited to no nitrogen fixation occurs. These ineffective symbiotic associations are characterized by the formation of small white nodules, which results in reduced or no plant growth promotion . Ineffective nitrogen-fixing symbioses have been described after introduction of crop legumes into areas where previously native legumes grew. 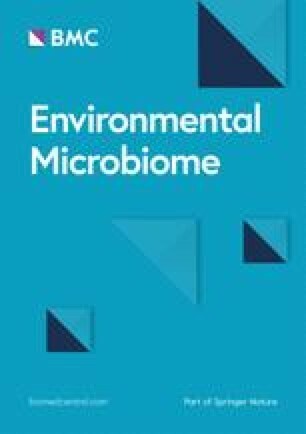 The soil microbiota associated to native species can often outcompete inoculant strains . For instance, ineffective nitrogen fixation occurs in fields where perennial and annual clovers co-exist [6, 7]. In field trials, inoculant strains were unable to completely overcome indigenous R. leguminosarum bv. trifolii strains and occupied on average 50% of the nodules . In extreme cases, it has been shown that endogenous rhizobia can completely block the nodulation of introduced rhizobia. For example, the nodulation of pea cultivars Afghanistan and Iran by rhizobial inoculants is suppressed in natural soils by the presence of a non-nodulating strain . However, although ineffective nodulation is a limiting factor for sustainable agriculture, the molecular basis underlying it remains largely unknown . Rhizobium leguminosarum (Rl) strains are cognate micro-symbionts of legumes, including Pisum , Lens , Lathyrus , Vicia , Phaseolus and Trifolium . However, a R. leguminosarum strain isolated from a Lotus corniculatus nodule in Norway exhibits a different compatibility range that includes several Lotus species and ecotypes. Rl Norway does not induce effective nodules in any Lotus species tested so far . Strikingly, there are host genotype specific differences in the nodulation phenotypes induced by Rl Norway, as it cannot induce nodules on L. japonicus Gifu, but induces bumps on L. japonicus Nepal, and white nodules on L. burttii and L. japonicus MG-20. This is in contrast to compatible Mesorhizobium strains that induce monomorphic phenotypes in the same plant ecotypes . The striking diversity of ineffective nodulation phenotypes induced by Rl Norway in Lotus motivated us to sequence and annotate its complete genome, and to compare it to the published genome of R. leguminosarum bv. viciae 3841 (Rlv 3841), a well-characterised R. leguminosarum strain. Here, we show that the genomes are largely conserved. There are no major differences in the nif and fix clusters required for nitrogen fixation and in the nod cluster essential for the production of nodulation factor. However, differences were observed in terms of metabolic and protein secretion system genes. Rl Norway is a Gram-negative strain in the order Rhizobiales of the class Alphaproteobacteria (Table 1). Cells are rod-shaped and have dimensions of 0.84 ± 0.11 μm in width and 1.43 ± 0.31 μm in length (Fig. 1a). This strain is fast growing and forms colonies after 3 days in TY medium at 28 °C. Colonies on TY are circular and slightly domed, their surface is shiny and smooth, and their texture is moderately mucoid (Fig. 1b). The phylogenetic relationship of Rl Norway was inferred based on a concatenated tree of the dnaK, recA, and rpoB house-keeping genes (Fig. 2). Based on this phylogeny Rl Norway is placed within the R. leguminosarum group. The 16S rRNA gene of Rl Norway shows more than 99.9% identity with its orthologs in other R. leguminosarum strains, such as Rlv 3841 and Rl biovar trifolii WSM1325, WSM2304, and CB782. The metabolic fingerprinting of Rl Norway was conducted with the Biolog GN2 MicroPlate. Rl Norway grew in multiple organic compounds as sole carbon source, these included Adonitol, L-Arabinose, D-Arabitol, D-Cellobiose, D-Fructose, and Glycerol, among others (Additional file 1: Figure S1). The metabolic fingerprinting of this strain was similar to the pattern described for other R. leguminosarum strains, but it was clearly distinct from the pattern of Rlv 3841 (Additional file 1: Figure S1) . Rl Norway was originally co-isolated from a L. corniculatus nodule together with two Mesorhizobium strains, but does not induce nodules in L. corniculatus or L. japonicus Gifu, when inoculated alone . However, it induces bumps on L. japonicus Nepal, and ineffective nodules on L. burttii and L. japonicus MG-20 . This polymorphic nodulation phenotype is not observed, when these hosts are inoculated with Mesorhizobium strains . Rl Norway induces ineffective nodules in Pisum, and Latyrus. The nodulation and symbiotic characteristics of Rl Norway are summarized in Additional file 2: Table S1. Rl Norway was selected for sequencing, because of the striking diversity of ineffective nodulation phenotypes that it induces in Lotus , a host that belongs to a different cross-inoculation group. The complete genome sequencing was performed at the Genomics Service Unit (LMU Biocenter, Munich). The nucleotide sequences reported in this study have been deposited in the GenBank database under accession numbers CP025012.1, CP025013.1, CP025014.1, CP025015.1, CP025016.1, and CP025017.1. The data is summarized in Table 2. Rl Norway was grown at 28 °C and 180 rpm for 2 days in TY medium. Genomic DNA was isolated from 30 ml of a bacterial suspension (OD600 = 1.0) using the CTAB method . The DNA quality was determined by nanodrop and gel electrophoresis. The genome was sequenced using a combination of Illumina and MinION sequencing technologies. Library construction and sequencing were performed at the Genomics Service Unit (LMU Biocenter, Munich). For whole genome sequencing a short read DNA library was generated with the Nextera Kit (Illumina) according to manufacturer’s instructions. Sequencing (2 × 150 bp, v2 chemistry) was performed on a MiSeq sequencer (Illumina) yielding around 15 Mio paired reads and 2.3 Gb of primary sequence. A long read library was prepared with the 1D Genomic DNA Sequencing Kit (Oxford Nanopores) according to manufacturer’s instructions. MinION (Oxford Nanopores) sequencing resulted in around 180,000 sequences with a total of 670 Mb primary sequence (mean length 3.8 kb). Hybrid genome assembly with Unicycler v0.4.0  using default settings resulted in six circular contigs. The average base coverage of the genome is 380x. Genome annotation was performed with RAST 2.0 [16, 17] and MicroScope . Clusters of orthologous groups (COGs) of proteins were predicted using the COGNiTOR software , signal peptides were detected using the SignalP 4.1 server , and Pfam domains were predicted using the Pfam batch sequence search from EMBL-EBI . Transmembrane predictions and CRISPR repeats were determined using the TMHMM Server v. 2.0  and CRISPRFinder , respectively. All genes discussed in the text were manually inspected. 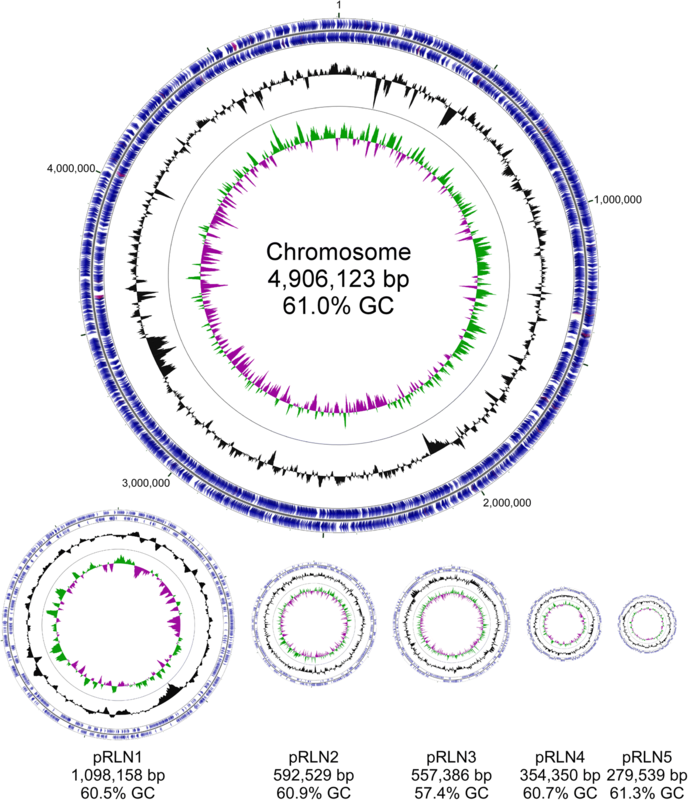 The genome of Rl Norway consists of 7,788,085 bp, distributed on a circular chromosome containing 63% of the genomic information and five large circular plasmids ranging from 280 to 1098 kb (Fig. 3). The complete genome and the chromosome are comparable in size to other R. leguminosarum strains [13, 24]. The chromosome contains three identical rRNA operons and 54 tRNA genes, none of which are found on any of the five plasmids (Table 3 and Fig. 3). In total 7866 protein-encoding genes were identified. BUSCO analysis  confirmed complete presence of the core bacteria dataset. The six replicons have a comparable mix of functional classes (Additional file 3: Figure S2A). However, all genes from the BUSCO core bacteria dataset are located on the chromosome, with only a few additional gene duplications on the plasmid replicons. The genomes of Rl Norway and Rlv 3841 have a very similar relative occurrence of functional protein encoding genes (Additional file 3: Figure S2B) and do not show any gross genomic alterations. Interestingly, although Rl Norway contains more protein encoding genes than Rlv 3841 (7866 vs. 7263 genes), the number of genes for which a functional annotation could be retrieved is almost identical (6106 vs. 6105 genes). Hence, the major difference lies in the number of not functionally classifiable genes (1760 vs. 1158 genes) (Table 4). The five plasmids contain one set of putative repABC replication system genes each . Comparative analysis of the Rep proteins from Rl Norway with those from Rlv 3841 revealed high identity between plasmids pRLN1 and pRL12, between pRLN2 and pRL11, and between pRLN5 and pRL10 (Fig. 4a). Gene content comparison and synteny analysis supported this result. Although large portions of pRLN4 and pRL9 are similar (Fig. 4b, and c), the RepABC proteins encoded in pRLN4 are more similar to their orthologs in pR132503. Plasmid pRLN3 is slightly different than the other replicons of Rl Norway (Additional file 3: Figure S2A). It does not exhibit significant similarity to Rlv 3841 (Fig. 4b, and c), has a slightly lower GC content and a lower proportion of protein encoding sequences (Additional file 4: Table S2), and has a higher proportion of putative encoded proteins without known homologs (Additional file 3: Figure S2A). In addition, it is the only plasmid containing potentially active transposons (2 copies) and several incomplete and therefore most likely inactivated transposon copies. The pRLN3 RepABC proteins share high similarity to their orthologs in pRL1. For genospecies classification, we compared the Rl Norway genome to representatives of the five proposed genospecies (gsA-gsE) . Typically, genomes are regarded to belong to the same species if the ANI values are above 95%. The two highest average nucleotide identity (ANI) scores (Rl CC278f: 96.34%; Rl SM51: 95.59%) were found with members of the genospecies gsD. All other comparisons resulted in ANI scores below 95% (Table 5). The ANI score between Rl Norway and Rlv 3841, which belongs to gsB, is only 93.26%. Although genospecies gsA and Rl CC278f in gsD are not yet well supported , the results indicate that Rl Norway belongs to genospecies gsD. This also fits well with Rl Norway having a plasmid subtype combination typical for gsD strains (& personal communication Peter Young). In terms of central metabolic genes Rl Norway resembles Rlv 3841. Both strains harbour genes encoding enzymes of the tricarboxylic acid (TCA) cycle required for aerobic respiration and energy production , of the pentose phosphate pathway required for the oxidation of glucose and the synthesis of nucleotides , and of the Entner-Doudoroff pathway for the catabolism of glucose to pyruvate . Both strains lack a gene encoding the phosphofructokinase, an essential enzyme of the Embden-Meyerhof-Parnas glycolysis. These genetic similarities were reflected in a similar growth pattern in different carbon sources using Biolog GN2 MicroPlates (Additional file 1: Figure S1) . A noticeable difference in the Biolog assay was the assimilation of amino acids such as D- and L-alanine, L-serine and L-proline, and nucleosides. However, no major differences were observed in the genes mediating their metabolism. The only clear exceptions were that Rl Norway lacks a putative D-serine deaminase required for the conversion of D-serine to pyruvate, but contains two putative aspartate ammonia-lyases (CUJ84_pRLN3000095, CUJ84_pRLN3000303) and two putative asparagine synthetases (CUJ84_pRLN3000485, CUJ84_pRLN3000155). In terms of amino acid transport, two ABC-type broad specificity amino-acid transporters have been characterized in Rlv 3841, Aap (AapJQMP) and Bra (BraDEFGC) . The bra (CUJ84_Chr003782–3787) and aap (CUJ84_Chr001810–1813) clusters are highly conserved in Rl Norway. Another interesting difference concerned the metabolism of butanoate. In contrast to Rlv 3841, Rl Norway did not grow on γ-hydroxybutyric acid (Additional file 1: Figure S1). This is supported by the lack of a gene cluster (pRL100133–138 in Rlv 3841) associated to γ-hydroxybutyrate utilisation . Furthermore, Rl Norway harbours an ortholog to the phbC1 gene (CUJ84_Chr001779), but lacks phbC2. These genes encode type I and type III poly-β-hydroxybutyrate (PHB) synthases, which are required for free-living and bacteroid PHB biosynthesis, respectively . Gram-negative bacteria secrete a suite of proteins via macromolecular complexes that have been classified as type 1–6 secretion systems in addition to the sec and tat transport systems . A survey of the Rl Norway genome indicates that this strain contains a large repertoire of secretion systems that is distinct from the repertoire of Rlv 3841 (Table 6). Rl Norway harbours five putative type 1 secretion systems (T1SS; Table 6). T1SSa, T1SSb and T1SSc are unique to Rl Norway. Interestingly, the genes encoding the T1SSa and T1SSc systems form operons with two large genes encoding putative repeats-in-toxin (RTX) toxins. The proteins forming the T1SSd and T1SSe have orthologs with more than 90% identity in Rlv 3841. For instance, the T1SSd proteins are orthologous to the PrsD and PrsE proteins of Rlv 3841 that are required for biofilm formation . Like Rlv 3841, Rl Norway lacks T2SS and T3SS, but harbours T4SS and T6SS . Bacteria utilize T3SS, T4SS and/or T6SS to inject effector proteins directly into eukaryotic host cells or into other bacteria [35, 36, 37]. In rhizobia, these effectors can mediate compatibility with the host . Rl Norway harbours a putative T4SS that is distinct from the T4SS from Rlv 3841. The respective T4SS encoding virB operons are not syntenic and the encoding genes share on average less than 30% identity. The T4SS of Rl Norway is encoded in the pRLN1 plasmid and is predicted to translocate proteins and not DNA, as Rl Norway lacks a VirD2 relaxase . In addition, it has the peculiarity that the virB11 gene is partially duplicated and two genes are located in-between the duplication. Rl Norway and Rlv 3841 harbour syntenic imp (tss) and hcp clusters encoding type (i) T6SS. In both cases the imp cluster is lacking orthologs to the evpJ and tssJ genes. However, a comparison to Agrobacterium tumefaciens C58 revealed that these genes are also absent in the corresponding imp and hcp operons (atu4330-atu4352). In addition, all essential genes for protein secretion are conserved . T5SS are structures in which the cargo protein translocates itself across the plasma membrane. These are classified into auto-transporters (translocator and cargo encoded in the same gene) and two-partner systems (translocator and cargo are encoded by two separate genes) . Rl Norway harbours two T5SS auto-transporters. However, T5SSb is split into two genes and it is probably not a bona fide T5SS. Rl Norway also has one two-partner system, in which the cargo protein is a putative filamentous hemagglutinin (Table 6). In contrast, Rlv 3841 contains three auto-transporters, but no two-partner system . 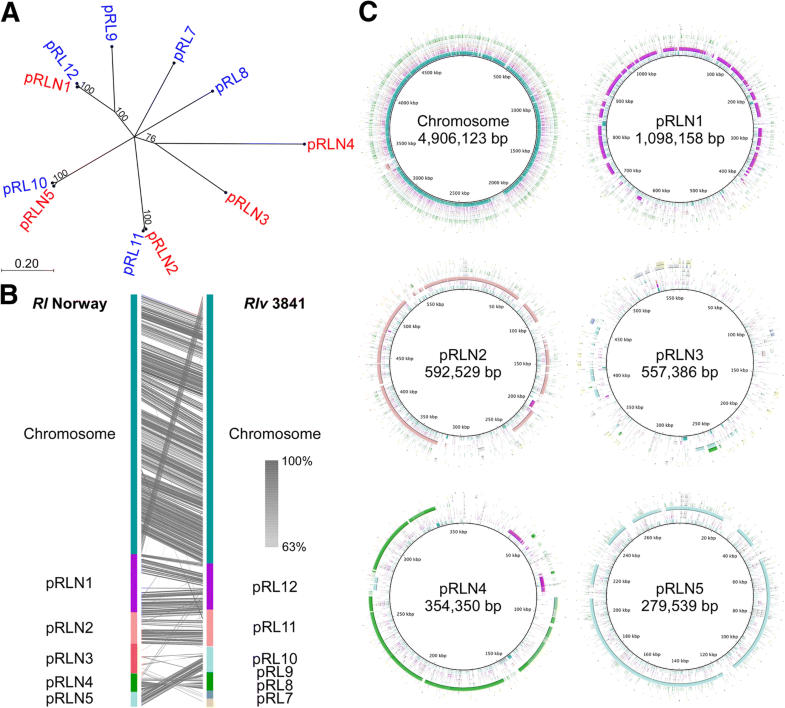 Plasmid pRLN3 harbours all symbiotic genes in Rl Norway. The nod genes that are required for the synthesis and export of the nodulation factor, a key determinant in compatibility, are organised in one cluster (CUJ84_pRLN3000416–426) comprising the nodJICBADFELMN genes. They have the same organisation as the nod cluster in Rlv 3841 , and the encoded proteins share at least 93.6% identity with their Rlv 3841 orthologs. However, in contrast to Rlv 3841, Rl Norway lacks nodO and nodT orthologs in the proximity of the nod cluster. Interestingly, genes encoding putative transposases flank the Rl Norway nod cluster. The genes required for nitrogen fixation are located in proximity. The fixABCX (CUJ84_pRLN3000397–400) and the nifAB genes (CUJ84_pRLN3000401–402) are located almost directly downstream nodJ, whereas nifNEKDH (CUJ84_pRLN3000271–275), fixSIHG (CUJ84_pRLN3000258–261) and fixPQON (CUJ84_pRLN3000263–266) are located approximately 137.5 kb downstream of nodJ. The three subunits of the nitrogenase encoded by the nifHDK genes share 99.7, 93.5, and 96.3% identity to their respective Rlv 3841 orthologs. A noteworthy difference between both strains is that Rl Norway harbours a single fixNOQP operon encoding the essential cbb3 terminal oxidase, whereas Rlv 3841 contains two copies . Furthermore, Rl Norway lacks genes encoding the FixK and FixL transcriptional regulators, which together with FnrN control the expression of the nitrogen fixation genes in other rhizobia strains . Instead, Rl Norway harbours two putative fnrN genes (CUJ84_Chr002641, CUJ84_pRLN3000544) that are located in the chromosome and in the pRLN3 symbiotic plasmid. This is reminiscent of R. leguminosarum bv. viciae UPM791, in which FnrN is the global regulator of the fix genes. In this strain, FnrN is regulated by micro-aerobic conditions and binds a palindromic element called anaerobox [43, 44]. Putative anaerobox sequences were found upstream of fnrN1 (CUJ84_Chr002641) and the fixNOQP and fixGHIS operons, which suggest that FnrN might regulate their expression in Rl Norway. However, no anaerobox was found upstream of fnrN2 (CUJ84_pRLN3000544). Interestingly, fnrN2 is approximately 16.5 kb upstream of a putative uptake hydrogenase cluster comprising 18 genes (CUJ84_pRLN3000511–528). The cluster organisation resembles the hup and hyp genes from Rlv UPM791 . Notably, Rlv 3841 lacks such a hydrogenase cluster. Although detrimental in agriculture, ineffective nitrogen-fixing symbiosis remains poorly investigated. In this regard, Rl Norway is an interesting strain as it exhibits a parasitic behaviour in a wide range of hosts. Comparative genomic analyses with other R. leguminosarum strains have the potential to reveal novel factors mediating symbiotic compatibility and efficiency. We thank Martin Parniske for providing the Rl Norway strain and critical reading of the manuscript, Moritz Thomas for expert technical assistance in MinION library preparation and sequencing, and Marion Cerri for insightful discussions and reading the manuscript. We specially thank Peter Young for sharing unpublished sequences and fruitful discussions. This work was funded by the German research foundation (DFG-grant: MA7269–1). JL performed the imaging, the chemotaxonomic analyses, and extracted the genomic DNA. AB conducted the genome sequencing and annotation. AH conducted the genome assembly and comparisons. MM conducted the phylogenetic analysis and the manual inspection of the annotation. MM and AB conceived the experiments and wrote the manuscript. All authors read and approved the final manuscript. Green E, Mecsas J. Bacterial secretion systems: an overview. In: Kudva I, Cornick N, Plummer P, Zhang Q, Nicholson T, Bannantine J, Bellaire B, editors. Virulence mechanisms of bacterial pathogens, Fifth Edition. Washington, DC: ASM Press; 2016. p. 215-39. https://doi.org/10.1128/microbiolspec.VMBF-0012-2015.